"Alice's Festival Of Romance" Romantic films often explore the essential themes of love at first sight, young (and older) love, unrequited love, obsessive love, sentimental love, spiritual love, forbidden love, sexual and passionate love, sacrificial love, explosive and destructive love, and tragic love. Romantic films serve as great escapes and fantasies for viewers, especially if the two people finally overcome their difficulties, declare their love, and experience life "happily ever after" - implied by a reunion and final kiss. Here "Alice's Festival of Romance" has been assembled below as an aphabetical list. 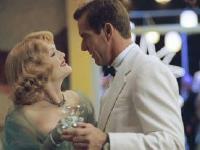 Should more precise scrolling be required, one should go to the specific genre, ie "Classic Romance", "Comedy Romance" , "Drama Romance" or even "Queer Cinema" Right: Julianne Moore and Dennis Quaid star in Todd Haynes' "Far From Heaven"